Machut’s Supper Club can accommodate groups up to 200 on Monday & Tuesday and up to 90 on Wednesday through Sunday, featuring family style service. Please ask your host or call for details. Pricing cannot be guaranteed for longer than 90 days from the date of booking. Privacy is not guaranteed for groups smaller than 60 on weekends because we try to accommodate as many groups as possible. 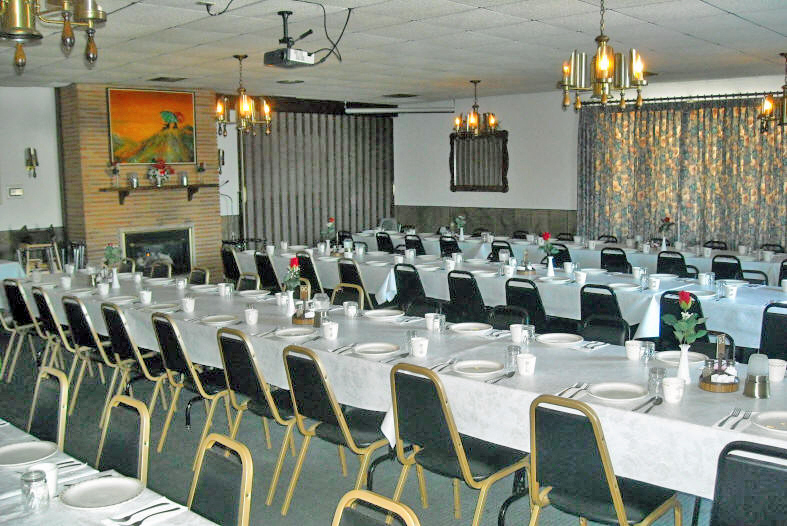 Family style dinners are also available by reservation to groups of 12 or more. Dinners include mashed potatoes, gravy, hot vegetables, gizzard stuffing, dinner rolls, cold salad center, knee caps, dessert, & beverage. Broasted potatoes may be substituted for mashed. A 15% gratuity and Wisconsin state sales tax is added to all family style dinners. If not satisfied with the service you receive, we will deduct part or all of the gratuity. NATURAL CASING WEINERS – can be added to any family style funeral menu for $1.00 per person. We require your group to have a minimum of 12 people for family style reservations on Wednesday through Sunday & 30 people minimum on Monday and Tuesday. Because of labor & other related costs, we can allow only a 10% shortage in attendance count (Example: We receive a family style reservation for 50 people, but only 40 attend. We would charge for 45 people.). If it becomes necessary to cancel your event, please cancel as early as possible. Failure to cancel your reservation without at least 24 hours’ notice will result in Machut’s Supper Club charging you in full for the reserved event. The person making the reservation will be responsible for all incurred charges. If you are reserving the space for your group or organization, we recommend that you collect from attendees in advance. You may find that you will have a larger number of people attending than originally planned. Unless prior arrangements are made, all charges are payable on the day of the reservation. We accept cash, personal & corporate checks, Visa, MasterCard, Discover, & American Express. Machut’s Supper Club reserves the right to arrange the tables in a manner most suitable to the size and type of event. We will certainly take into consideration any special needs or requests you may have. Feel free to decorate your tables. However, we charge a minimum $25.00 clean-up fee if confetti or metallic sprinkles are used. Keep in mind that the more table decorations you have, the less room we have for food placement. The tables will be covered with vinyl tablecloths; linen tablecloths can be ordered at least three weeks ahead of the event for $3.00 each. Damage to our vinyl tablecloths caused by staining or burning from decorations or writing from markers or pens will be billed at $9.00 per 8-foot tablecloth. Tables are set with two-ply paper dinner napkins; linen napkins can be ordered at least three weeks ahead of the event for $0.35 each. Wisconsin State Statutes require that all alcohol beverages consumed on a licensed premise are to be purchased from that licenced premise. Wisconsin Department of Health Codes require that all food consumed at a licensed restaurant be from an approved and inspected source. No food (except commercially-prepared wedding, anniversary, and birthday cakes) is allowed to be brought in for an event. No alcohol is allowed to be brought in for an event.